A robust and accurate site map is the foundation for site management and remediation. However, most mapping techniques are intrusive and are not cost effective. The few non-intrusive mapping techniques that currently exist are not specific to petroleum-based biodegradation, nor do they consider environmental variability over time. This makes their use questionable, a non-ideal situation when planning remediation. NSZD and soil gas transport play an important role when mapping oil spills at surface level, as the contaminants generate CO₂ as a byproduct of biodegradation. 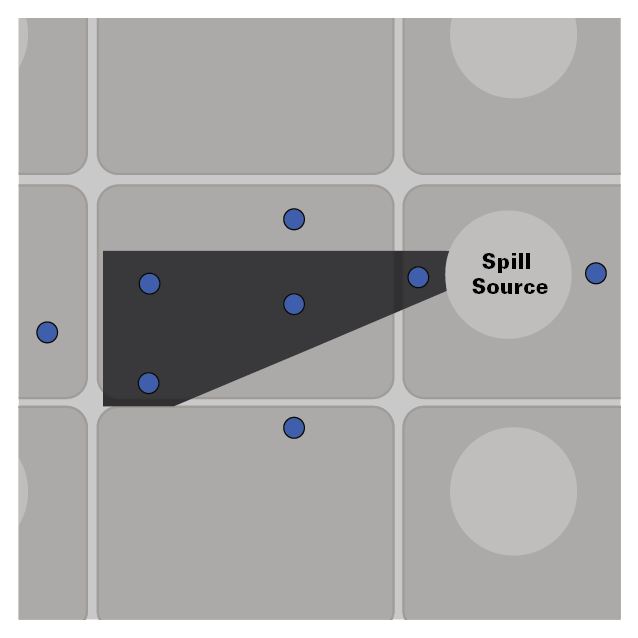 Using a non-intrusive technique that provides an unequivocal signal associated with the fossil fuel contaminant can efficiently guide the location of more permanent monitoring wells, significantly reducing overall monitoring costs. Map Traps are passive samplers that measure CO₂ flux and utilize a qualitative ¹⁴C measurement technique to provide a binary (yes/no) indication of LNAPL presence at testing locations. The Map Traps measure total CO₂ flux over a two to five day period, providing a time-averaged estimate that accounts for environmental variations such as temperature, atmospheric pressure, and tidal changes. The Map Traps provide a binary indication of biodegradation on LNAPL in the surface which allows for source delineation. This makes the map traps a valuable, cost-effective decision-making tool for the placement of wells and a starting point for future remediation or NSZD monitoring efforts.